Oughtons Mill in Sutton Coldfield closed down about 150 years ago when Mr. John Jerome transferred its gun-barrel making business to his main factory in Birmingham’s Gun Quarter. The gun barrel mill had been built nearly 300 years ago by Joseph Oughton, a Birmingham gunsmith who needed more capacity to cope with the increasing demand for his products. At that time water power was needed to drive the large grindstones, and Oughton was able to acquire a suitable site in Sutton with potential for a water-mill. The first mention of Oughton’s gun barrel mill is in a deed of 1740, so it was probably in production by then. 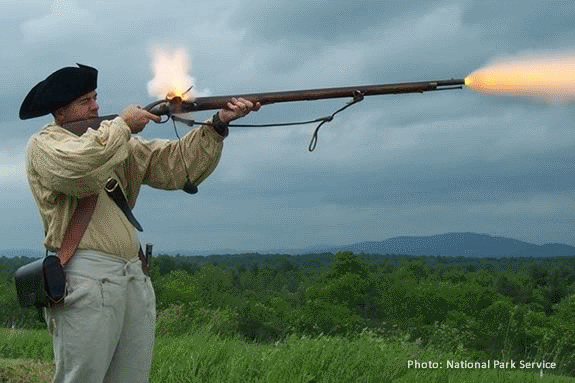 Joseph Oughton was one of the leading manufacturers of gun barrels - in 1756, at the start of the Seven Year’s War, the Board of Ordnance ordered 6,000 gun barrels for land muskets from Oughton’s firm, and many more were being supplied to other customers. Oughton had other mills besides the Sutton one in addition to his main works in Smallbrook Street, Birmingham, but some Sutton-made weapons perhaps accompanied General Wolf in his famous victory against the French on the plains of Abraham at Quebec in 1759. The water power was required to turn the large grindstones; grinding was done on the fast-moving rim of the stone, the grinder perhaps standing or sitting astride the stone, which was continually drenched with water for lubrication and cooling. The processes carried out at the mill were grinding, boring, and sharpening - the 1851 census lists two grinders, Thomas Day and James Smith, and a borer, William Wilkes, living on the premises, while the 1861 census gives James Smith as a sword and bayonet grinder. Some forging may have been done, but most of the mill was devoted to finishing the products made in Birmingham. Oughton’s Mill in 1856 consisted of a large building with a mill on the ground floor and two dwellings on the floor above it, two more dwellings and four workshops. The four dwellings were occupied by skilled mill employees, no doubt casual labour was employed as required from the local area, and Joseph Oughton sometimes took on boys as apprentices. By 1863 the processes carried on at the mill could be performed much more cheaply and efficiently using steam power, so the new owner, John Jerome, closed down Oughton’s Mill and moved the works to his Birmingham factory. The buildings were demolished, most of the pools were drained, and the whole area landscaped. One pool was retained as a garden feature - Miss Holbeche records “1868 April 8th. A poor girl was found drowned in Mr. Jerome’s pool”. The site of Holland House with its grounds and Oughton’s Mill is now occupied by Plantsbrook School, and the E Brook which was harnessed to power the mill was deepened and straightened in the 1960s, so there is now nothing of the mill to be seen. If there are any remains of this once busy works they lie beneath the year eleven playground of Plantsbrook School. 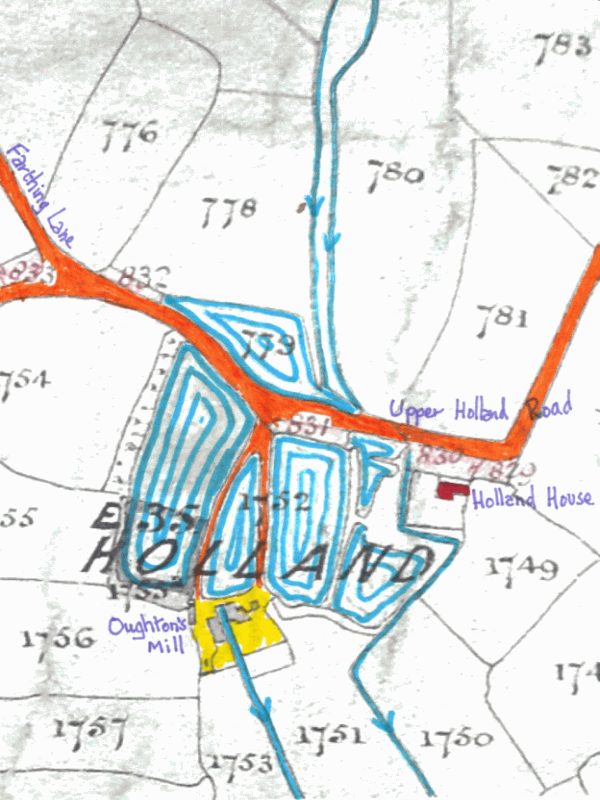 Detail from the 1824 corn rent map, showing the site of the mill and the extensive ponds formed in order to gain a sufficient head of water to drive the mill.